Saturday is the new round of The Neighborhood, in which Fetch will be participating with this cute entry table set for 200L. The decor on the table can be unlinked if you want to use it for RP purposes, or you can leave it as is for a modern touch. 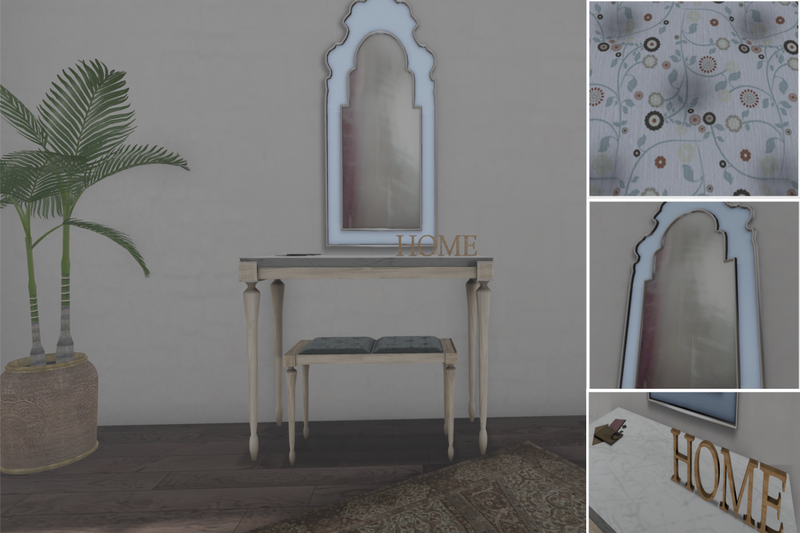 I especially like the cute fabric on the bench, which does have sitting animations, so you could also make the set into a really nice dressing table as well! I'm still in full Gor mode, though I haven't had the opportunity to actually get on the Ar sim and RP much. If you hadn't noticed, I reformatted my blog this week, and today I have a job interview, so my life has been too busy to really just relax and enjoy some role play. Labels: Atomic, Candydoll, Fantasy, Fetch, Gorean, Interiors, Ison, Junbug, Ploom, Second Life, V.e.